This was definitely as good as it looks and super filling! The teff in this is a new ingredient I have just started using for its amazing health benefits. A grain used as a staple in many Ethiopian dishes, teff is a very tiny grain that is so small that it can only be eaten in its whole form. Containing 123mg of calcium per cup, teff leads all grains in calcium content and has the same amount of calcium as 1/2 of a cup of cooked spinach. Additionally, it is high in resistant starch meaning that it is high in dietary fiber which can help control blood sugar and can be beneficial for weight management and colon health. Teff is also high in protein and it has been estimated that Ethiopians get about 2/3 of their dietary protein from it (Whole Grains Council). Teff cooks similarly to quinoa, absorbing the water as it cooks. It is prepared in a 3 to 1 ratio, liquid to teff. 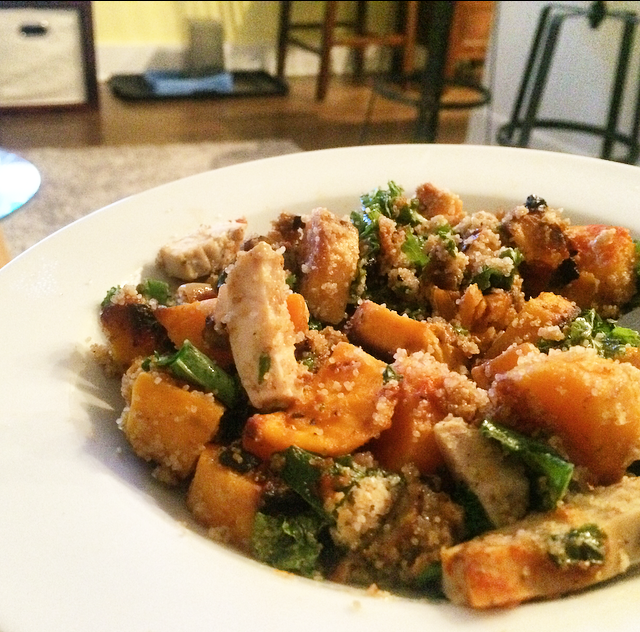 This entry was posted in 10k Team, Dinner, Recipe and tagged dinner, fall-favorite, gluten-free, healthy, runners diet, whole grain. Start you waffle iron up to get it heated. While it is heating combine all of the dry ingredients in a large bowl (cornmeal through coconut sugar). In a separate bowl, combine the eggs, olive oil, greek yogurt and cashew milk. While the waffles are cooking combine the vinaigrette ingredients together in a mason jar and shake. Put all of the salad ingredients together in a bowl and toss together with however much vinaigrette that you desire. 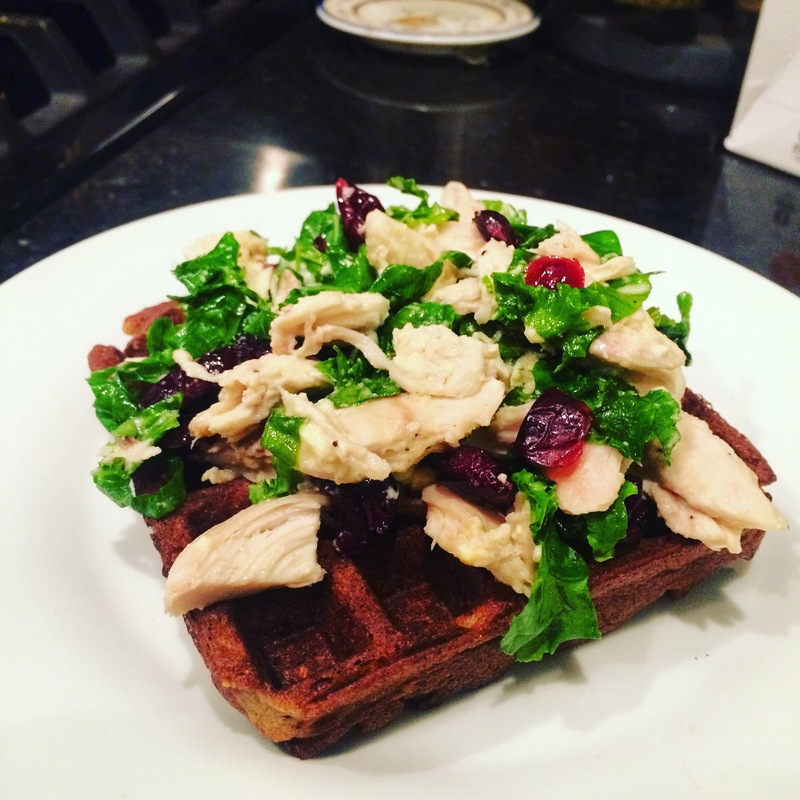 This entry was posted in Dinner, Recipe and tagged cornbread, fall recipe, fall-favorite, gluten-free, healthy, kale, waffle, whole grain. 1 fully cooked chicken breast, sliced (I buy this from traders joes, they sell them individually sealed and already cooked so they make it easy for me to prepare quick dinners in a hurry!) Use 2 if you do not add the sausage above. Preheat oven to 425 with the rack in the center of the oven. In a small bowl, whisk together the mustard, maple syrup and thyme leaves. Pour mixture over potatoes and toss well to combine and evenly coat the potatoes. If you need more sauce to evenly coat you can always make more! Pour everything onto a greased baking sheet and roast in preheated oven for 40 minutes or until the potatoes are soft. You may want to toss the potatoes around about 20 minutes to make sure they roast evenly. While the potatoes are cooking, salt the water and bring it to a boil. Once the water is boiling add the teff and reduce the heat to a simmer. Cover the pot and cook until the water has been fully absorbed. Now to assemble the salad! In the large bowl the potatoes were tossed in, add the chopped kale, goat cheese, potatoes, teff, and chicken (may want to warm the chicken in the microwave briefly before adding). Toss everything together and serve with as much or as little maple siracha dressing as you like! This entry was posted in Dinner, Recipe and tagged fall recipe, fall-favorite, gluten-free, healthy, kale, papa spuds, teff, whole grain. To make butternut squash puree preheat oven to 400 and combine butternut squash and garlic in a bowl. Add 1 tbsp. olive oil and salt and toss to evenly distribute. Spread out on cookie sheet and bake for 15-20 minute or until squash is fork tender. Place squash in blender with maple syrup, ¼ cup water (if needed), and 1 tbsp. olive oil if necessary. Blend until smooth. Reduce oven temperature to 350 degrees and grease 2 cupcake tins with coconut oil. In a large bowl combine the Bi Pro, oatmeal, almond meal, brown rice flour, tapioca starch, baking soda, baking powder, salt, cinnamon, and pumpkin pie spice. In a blender or food processor blend the dates and date water for 15 seconds. Then add the eggs, vanilla, butternut squash puree, and the maple syrup. Pulse the ingredients until just combined. Now add wet to dry and mix until combined. Once ingredients are combined fold in the chocolate chips. Using an ice cream scoop, scoop a little less than a full scoop and place in cupcake tin. Should make about 15 muffins so fill the rest of the tins half full with water. Bake for 20-30 minutes or until a toothpick comes out clean. Now you will see in the picture above that I put a little topping on the muffins. This topping is my Pumpkin Cashew Butter, I had to make something pumpkin! 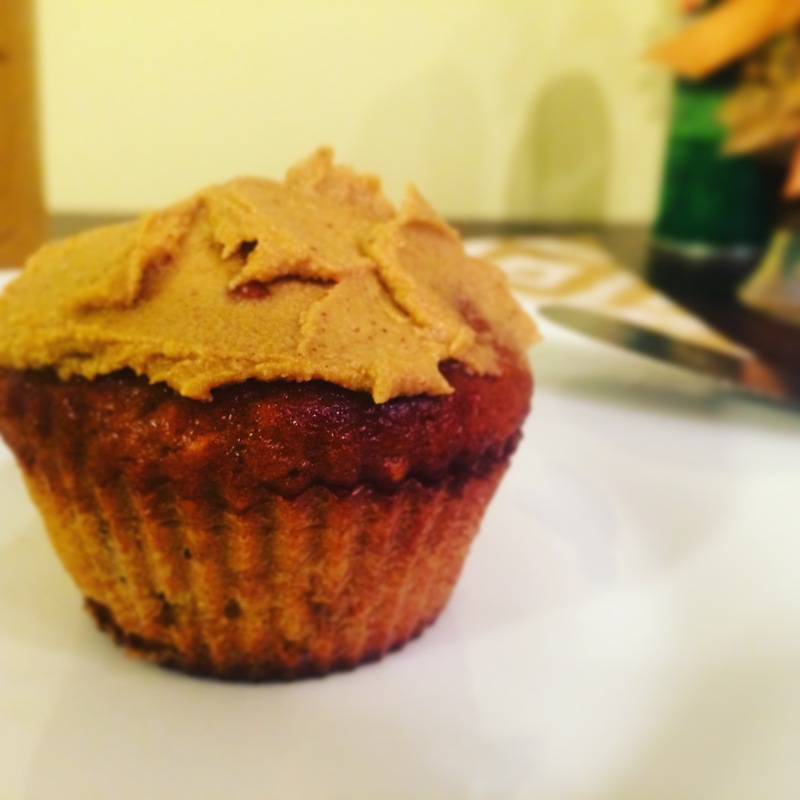 This recipe was inspired by Purely Elizabeth’s pumpkin peanut butter recipe featured in the October Magazine. This stuff is addicting so beware! Preheat oven to 350 and spread raw cashew out on baking sheet. Place in preheated oven and watch carefully. Once cashews have started to brown and are fragrant remove from oven and our into food processor or high speed blender. Process or blend cashews until finely ground. Add remaining ingredients to blender or food processor and blend until all ingredients have become thoroughly combined. If necessary you may need to add a bit of water. Stop and scrape down sides as necessary. 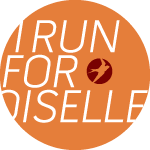 This entry was posted in Breakfast, Pre-Run, Recipe, Snack and tagged breakfast, butternut squash, dairy-free, dark chocolate, fall recipe, gluten-free, muffins, pre-run, pumpkin, whole grain.